The parish of Wacton is situated in the southeast of Norfolk. It lies east of Great Moulton, south of Forncett, west of Long Stratton and north of Tivetshall St Margaret. The name Wacton may derive from the Old English meaning ‘Wacca’s enclosure’. The parish has a long history and was well established by the time of the Norman Conquest. Its population, land ownership and productive resources were detailed in the Domesday Book of 1086. This document revealed that the parish was part of the lands held by Roger Bigot, and lists various agricultural resources. The earliest sites to be identified in the parish date to the prehistoric period and take the form of pot boiler scatters (NHER 14231, 16767 and 24961). These flints were heated over fire and then used to warm water for cooking or washing purposes. The only prehistoric finds recovered from Wacton comprise a scatter of worked flint flakes (NHER 24956 and 24961). Very few finds from the subsequent Bronze Age are on record. A couple of flint tools (NHER 10066) from the early part of the period were found during metal detecting and a socketed bronze spearhead (NHER 30397) dating to the latter part of the period was found during a fieldwalking survey in 1981. A similar scenario exists for the Iron Age, with the only finds to have been reported being silver coins (NHER 42714) and pottery sherds (NHER 30397). During the Roman period a major road ran through the parish. The Pye Road (NHER 7947) runs between Scole and the Roman town of Venta Icenorum at Caistor St Edmund. It can be seen on aerial photographs of the parish and is also marked on old maps. Extensive metal detecting across the fields of Wacton has recovered various Roman artefacts. The finest artefacts included a gold coin found near Wash Lane (NHER 33936), a finger ring with an oval glass setting (NHER 32293) and a seal box lid (NHER 42714). Other more mundane finds include pottery sherds (e.g. NHER 14232, 20950 and 36607), a pinhead (NHER 35346), part of a ceramic flagon (NHER 24965) and a dolphin brooch (NHER 30397). However, perhaps the most significant find was evidence for the manufacture of barbarous radiate coins at a site to the south of the village (NHER 42714). No Saxon sites have been reported for Wacton. Many of the small finds that have been recovered comprise pottery sherds (e.g. NHER 24959 and 15614). Most of the other metalwork objects date to the Late Saxon period, and these include a possible triangular box mount without decoration (NHER 30397) and a finger ring or earring (NHER 42714) made from copper alloy. The only Saxon coin to be unearthed has been identified as a sceat dating to the middle part of the Saxon era (NHER 35157). A large number of the archaeological records for Wacton relate to the medieval period. All Saints’ Church (NHER 10058) was built in this era and was once the church of Great Wacton. 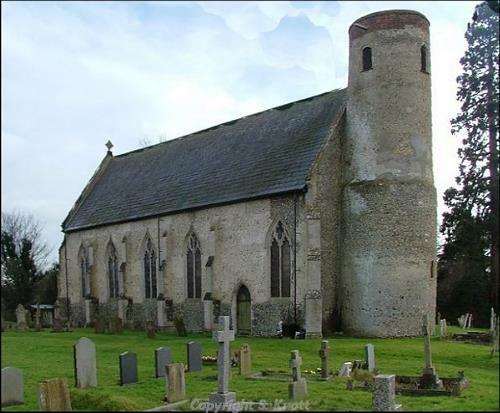 It has a round tower of probable 12th century date which was recoated at the base in the 14th century. The remainder of the church is largely in the Decorated style prevalent from 1290-1350. The settlement of Little Wacton also had a church dedicated to St Mary (NHER 10072). It became a chapel in 1500; fell into disrepair in 1510 but was in use again in 1522 when the tower was used as a dovecote. Sadly, nothing now remains of the church. It has been suggested that the deserted medieval village of Little Wacton existed in the vicinity of Wacton Hall (NHER 10063). The moated site with fishponds would certainly seem to suggest a medieval manor house could once have stood here, with the village set in the surrounding area. However, the current Hall is a two cell, two storey, early 16th century building with massive timbers. Another possible manorial site (NHER 10071) has been identified to the northwest of Grange Farm on Common Road. A moated enclosure exists here, with parts still filled with water. Documentary research shows it may be the site of Parkes Manor House. A couple of medieval houses are also on record for Wacton. White House or White Lodge (also known as Pecks Farm and Bretts Manor) dates to the 14th century. This raised aisled hall has a remarkable roof constructed from an arch-braced tiebeam on posts rising from an arch-braced truss. However, despite the fact that this property is known as Bretts Manor recent research suggests that Wacton House (NHER 10078), a 17th century Georgian building, sits upon the site of Bretts medieval Manor. A great diversity of medieval small finds have been discovered by fieldwalking and metal detector surveys. Some relate to religion; like the lead medieval badge (NHER 42714) and boy bishop token (NHER 30397). Others relate to personal adornment and these include a finger ring inscribed with a black letter (NHER 29681), a brooch (NHER 35833) and an unusual buckle frame (NHER 35157). A lead bale seal (NHER 12312) found in 1976 may indicate trade activities in the parish. Other finds comprise coins (e.g. NHER 50101), with a splendid gold coin of Henry VII (NHER 30397) amongst those recovered, and numerous pottery sherds (e.g. NHER 14234 and 24953). During the post medieval period a large number of residential buildings were constructed, many with timber frames. Many of them cluster around Wacton Green, including Owl Cottage (NHER 45512) Quintons (NHER 45717), Stuart House (NHER 45759) and Park Farmhouse (NHER 48476) all of which date to the 17th/18th century. Fine post medieval farmhouses can also be seen on Sallow Lane (see NHER 45716) and Haytons Lane (NHER 48663). Other properties worth a look include Grange Farm with its thatched roof and octagonal chimneys (NHER 15329) and Yeoman Cottage/Wilderness Cottage – a pretty timber-framed building that has been subdivided (NHER 38122). During the post medieval period Wacton also had an operational post mill (NHER 15357). This stood south of Wacton Common, on the site of Old Mill House from 1675-1902. It was last used in 1900 and was sold and removed in August 1902. The Eastern Union Railway (NHER 13578) also ran through Wacton in the 19th century. This important route to London didn’t stop in Wacton itself but villagers could happily catch the train from the station in nearby Forncett up until its closure in 1966. As with the medieval period, a decent selection of post medieval artefacts have been recovered. These objects range from a cowbell (NHER 16769) and coin weight (NHER 35157) to a silver strap fitting (NHER 24955) and the end cap of a knife, which had been shaped to resemble a horse’s hoof (NHER 30397). However, as is typical, the vast majority of the items to have been found take the form of pottery sherds (e.g. NHER 16768 and 20950) and coins (NHER 50101). No sites or finds from World War One, World War Two or the modern period have been recorded for Wacton. Thomas Sunley (NLA) 2 August 2007.